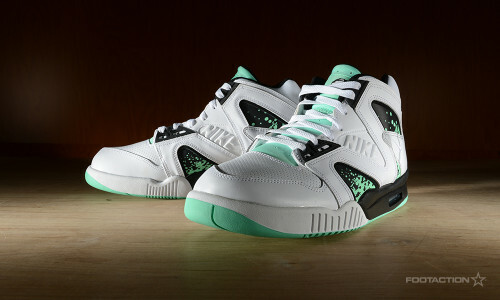 In a primarily white leather upper for a stand-out daytime look, the Nike Air Tech Challenge Hybrid “Green Glow” steps up to announce its presence. The sneaker in itself is a collision of tennis classics coming together. Characterized by signature graphics from the Air Tech Challenge I, III, and IV to create a brand new sneaker all together. Bringing on an updated look to tennis footwear with a lineage of decades past, the Andre Agassi mash-up boasts black accents on the lining, eyelets, underlays and midsole. To cap it off, green glow graces the tongue, graphic and outsole, sporting the same shade seen on the Air Jordan 4. Print article This entry was posted by hhcblog on July 18, 2014 at 2:50 am, and is filed under Footwear. Follow any responses to this post through RSS 2.0. You can leave a response or trackback from your own site.